Alike is an enterprise backup and recovery solution for Citrix XenServer, Microsoft Hyper-V, and Windows servers. Alike secures your data and protects your business from even the worst disaster, while minimizing downtime. Including global deduplication, instant file-level recovery, and disk/memory state backups, Alike’s robust suite of features and functionality provide full backup security. Perform faster backups – regardless of the supported platform – from incremental forever file-system awareness and deduplication to changed block tracking. Alike’s feather-light footprint doesn’t interfere with your environment’s valuable system resources, and scales easily to protect setups of any size. Our flexible licensing model is a cost-effective way to protect virtual hosts or physical machines. Manage virtual and physical backups and restoration from a single location intuitively and quickly – even across platforms. Our friendly, experienced, customer-devoted staff is here to provide technical assistance and answer any questions about our products. The best storage savings available from the industry’s leading global deduplication capabilities. Save space, bandwidth, time, and money with our enterprise backup features. Restore files, folders, and databases from any backup in just a few clicks. Automatic data validation and self-healing technologies prevent disruptive data corruption and provide peace of mind. Disks and running system memory are protected and restored with the same ease. Whether it’s a XenServer, Hyper-V – or now physical systems – Alike adapts quickly to its surroundings. You decide how you want Alike to work within your environment thanks to its agentless and agent-based technologies. Manage your backups from any computer or mobile device with increased simplicity, speed, and visibility. Easily Scalable. Easy on Environments. Alike’s ability to back up any or all drives in any VM allows for flexible integration with existing back up systems. Schedule your jobs to run daily, weekly, monthly, or multiple times a day. Stay up to date on the success of your jobs with automated updates via the Alike console, system log, or email. With the release of Alike v5.0, we will roll out a new Alike Appliance (A2) will provide an affordable, flexible, turnkey backup and recovery solution for comprehensive data protection. *Desktop installations of Alike are not recommended for production backups. Both Alike editions are licensed per socket to provide a scalable, affordable solution to protect your Citrix XenServer, Microsoft Hyper-V, and Windows-based physical systems. *We proudly offer special pricing for academic nonprofits and government agencies, as well as volume discounting for large environments. For special pricing, simply request a quote for nonprofits or volume discounts. Get secure backup functionality with a robust set of user-friendly features, providing nearly hands-free operation. With Alike, your IT staff can focus their attention on other important business requirements. You won’t have to worry about a thing. We’ve got this. 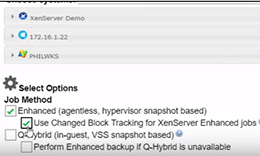 Watch our video on how to use CBT for XenServer backup and replication jobs. Click here. Quadric Software's support is best in the industry!